Announcement Here you will find well written and easy to follow CROCHET PATTERNS, with a focus on perfect fit. Modern and stylish sweaters for women and kids, with Sylvie Damey's signature super long hoods ! Here you will find well written and easy to follow CROCHET PATTERNS, with a focus on perfect fit. Modern and stylish sweaters for women and kids, with Sylvie Damey's signature super long hoods ! Item did not have wool ply suggestions. Pattern has good instructions for a beginner but more support in yarn types would have been amazing. In love with these patterns. Well explained. Sometimes a bit difficult but with a little logic it all works out well. My Jehanne hooded cardigan, with a super long hood... 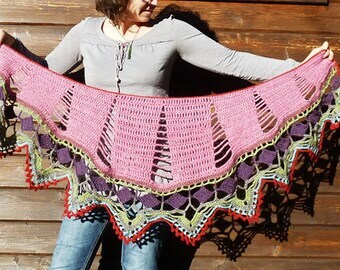 I made it to match my daughter's Ermeline and love wearing it ! Hi, I'm Sylvie, french crochet designer living in the beautiful french Alps with my husband and 2 daughters. I learned to knit as a child and from very early had a fascination for wool and yarn. I stil have this vivid memory of staring at wool roving through a shop window and thinking how being surrounded by craft supplies all day was the dream life. Those crafts are still not very developped here in France. But little by little using the fabulous internet resources I learned to dye and spin my own yarn, do felting and to crochet. I never looked back. Now I mostly crochet, and publish my crochet patterns both in french and english. I also teach locally felting/spinning and crochet classes. And I am a professional translator specialised in knitting and crochet. I work for various french book editors, yarn brands or independant designers. I love to crochet cute outfits for my daughters... and then like them so much that I make matching ones for me ! I hope you'll like them too. I'm a one-person business: I design the patterns, write the instructions and publish the patterns. I take photos. I run my french website (FibreCreative) and my english website (ChezPlum) and several shops on Etsy, Ravelry ect... I love it !